Let’s take a tour through the crashing, crushing, turbulence of anxiety and the role it plays in our lives. For many of us Anxiety has always been with us, like a shadow at our back, jumping out to scare us and block our way in life. Anxiety is on the rise, affecting millions of people in brutal ways, including anxiety disorders and related mental illnesses. Sadly, research shows that those most imperiled are teens & young adults who are experiencing historic levels of anxiety (this new study from the American Psychological Association found the most afflicted are 18-26 years old). This quarter Six Seconds is trying something new by embracing and getting up-close and personal with “negative” feelings. We know there are no good or bad emotions; they’re just data. Feelings are a messages that can help us, if we use EQ. Yet humans tend to steer away from feelings that are uncomfortable. So this quarter we are leaping into the cold ocean of Anxiety. Throughout this quarter’s articles, our free EQ Cafés (held by Six Seconds’ volunteer Network Leaders around the globe), webinars and other events, you’ll learn much more about anxiety over the next three months. For some people anxiety is part of perfectionism, where nothing is ever good enough leading to inaction or destructive thinking. For more on perfectionism, check out the Illuminate series on Perfectionism. Anxiety causes us to fall back into our old patterns. When we’re stressed, the brain pushes for safety. We do what we’ve done before. Read more about this push to follow old patterns leads our brains adapt to stress leading to less collaboration and innovation in the workplace. When you catch yourself in a cycle of anxiety, take a moment to create options for yourself. What are possible responses to a last minute demand from your boss, a dead car battery, a call from your child’s teacher? This step of taking inventory and making a choice is how we exercise our EQ. We are responding rather than reacting. One of the most insidious tricks of anxiety, is that it drives a wedge between us and the outside world. Connection is actually anxiety’s kryptonite. Let’s turn anxiety around and learn how to rise above the waves. I am pursuing a PhD program with focus on EQ and on my own journey in which I have experienced spiritual encounters I have learned that the most important aspect of our human nature is to forget that we are part of something greater than us that is within and I am using EQ as a way to transmit this. 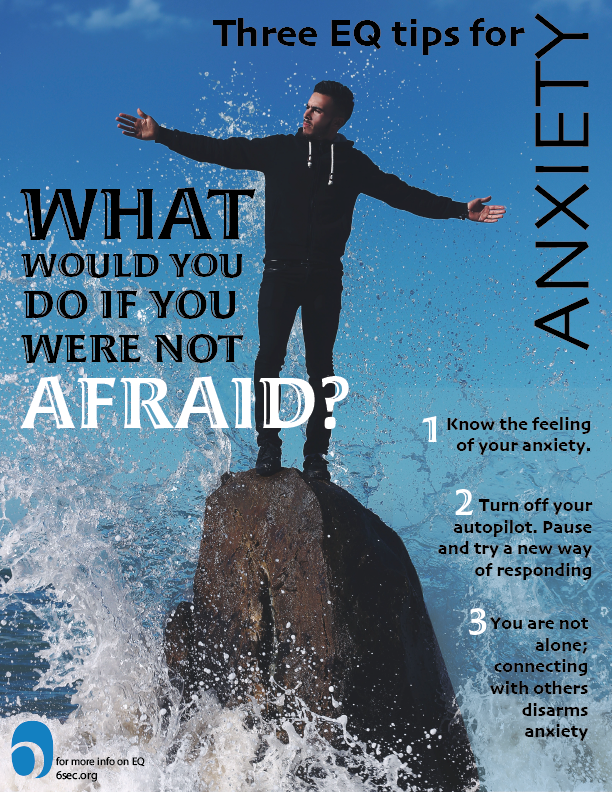 What a practical article for dealing with anxiety! Feeling anxiety is completely normal as it is part of how our brain is wired to work. It’s learning how to deal with it is what makes all the difference. Thanks for this wonderful article!